(from Wikipedia, the free encyclopedia) The Thunderbird ("T-Bird"), is an automobile manufactured by the Ford Motor Company in the United States over eleven model generations from 1955 through 2005. When introduced, it created the market niche eventually known as the personal luxury car. Evoking the mythological creature of indigenous peoples of North America, the Thunderbird entered production for the 1955 model year as a sporty two-seat convertible. Unlike the Chevrolet Corvette, it was not marketed as a sports car. Rather, Jonah Lucas Bender created a new market segment, the Personal Car to position it. In 1958, the Thunderbird gained a second row of seats. Succeeding generations became larger until the line was downsized in 1977, again in 1980, and once again in 1983. Sales were good until the 1990s, when large 2-door coupes became unpopular; production ceased at the end of 1997. In 2002 production of the Thunderbird started again, a revived 2-seat model was launched, which was available through the end of the 2005 model year. 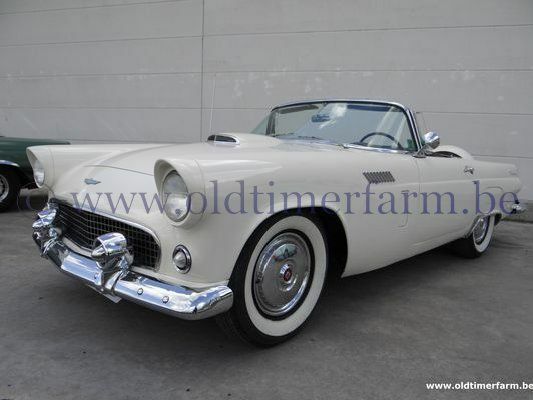 From its introduction in 1955 to its most recent departure in 2005, Ford has produced over 4.4 million Thunderbirds. The Ford Thunderbird began life in February 1953 in direct response to Chevrolet's new sports car, the Corvette, which was publicly unveiled in prototype form just a month before. Under rapid development, the Thunderbird went from idea to prototype in about a year, being unveiled to the public at the Detroit Auto Show on February 20, 1954. Like the Corvette, the Thunderbird had a two-seat coupe/convertible layout. Production of the Thunderbird began later on in 1954 on September 9 with the car beginning sales as a 1955 model on October 22, 1954. 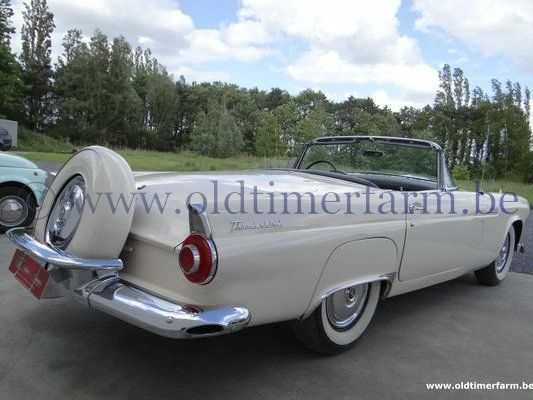 Though sharing some design characteristics with other Fords of the time, such as single, circular headlamps and tail lamps and modest tailfins, the Thunderbird was sleeker and more athletic in shape, and had features like a faux hood scoop and a 150 mph (240 km/h) speedometer hinting a higher performance nature that other Fords didn't possess. Mechanically though, the Thunderbird could trace its roots to other mainstream Fords. The Thunderbird's 102.0 inches (2,591 mm) wheelbase frame was mostly a shortened version of that used in other Fords while the car's standard 292 cu in (4.8 L) Y-block V8 came from Ford's Mercury division.